A sigh, a cry and a prayer! 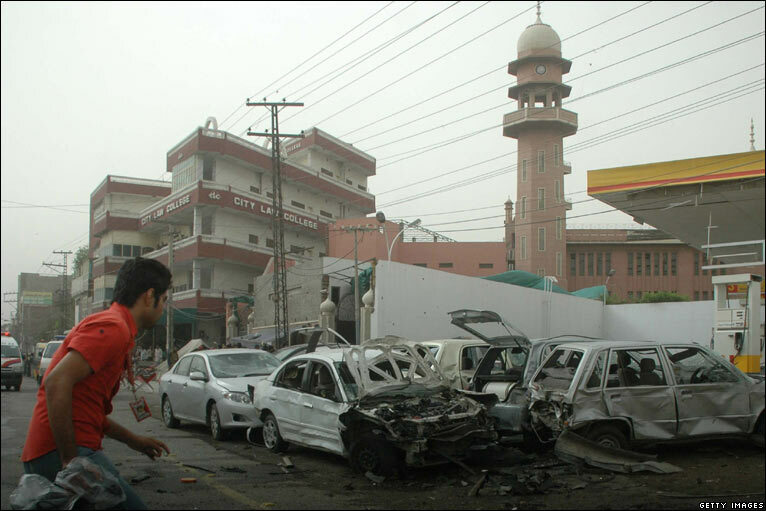 May 28, 2010 – Another dawn on Lahore brought one of the bloodiest massacres of innocent human life in the city’s recent history. As came time for Friday prayers, terrorists stormed two worship places of the minority Ahmadi community at Garhi Shahu and Model Town areas while opening fire indiscriminately at the gathered people. The result was all too sad – 82 innocent lives, including children, lost to terrorism! Around seven militants showed highly coordinated planning as they opened indiscriminate and heavy gunfire using grenades, AK-47s while culminating the siege with suicide bombings. As we cannot afford to lose hope, we can only pray for those who lost their lives this Friday and our condolences go to the relatives of innocent victims of May 28. So far, responsibility of the horrendous attacks has been put on the Punjab-based factions of TTP while the Federal Government has claimed that they had intelligence reports on a possible attack on the Ahmadi community well in advance. The planning, coordination and the ever expanding civilian targets of these attacks raise alarming concerns for every Lahori and Pakistani in general. While there seems hardly any place safe from the terrorists, it is also a sad truth that some targets are too vulnerable to be ignored. Ironically, many of them fall out of the category for security installations, government institutions and senior officials. Although, the security forces, specifically the Lahore Police, should be appreciated for ending the siege within four hours, however, the need for effective intelligence is desperately there in order to preempt the terrorists’ attempts. We need efforts like this instance where police caught 1,500 KG of explosives which were going to be used for all too obvious reasons. Let’s hope for a tomorrow where every Pakistani will have a right to peacefully co-exist with people belonging to any caste, creed or religious affiliations. And be clear that Friday’s attacks were undertaken by the same who have killed innocent men, women and children all across the country, regardless of their sect. They are terrorists; deserve no leniency in front of the law and will soon face their pitiful end. At the Liberty Roundabout, which was the scene of a bloody ambush of the Sri Lankan Cricket Team on March03, it has become a daily feature for passers by to stop and pay respects to the memory of the martyred policemen. Six of the men guarding Sri Lankan Team’s convoy lost their lives while battling about twelve very heavily armed militants right in the heart of Lahore in broad daylight. Lahorites are proudly commemorating the bravery of these men who sacrificed their lives to save what is left of this country’s international image. It was due to the cover provided by deterrence of these men lasting 25 minutes against the terrorists that the bus carrying the Sri Lankans was able to escape to safety of the Qadaffi Stadium. Would they have not fought bravely enough, the whole Sri Lankan team might have been taken hostage or in a worse scenario; killed! As you do a roundabout at Liberty, you can see stacks of flowers and bouquets coupled with hand written charts, banners, posters and candles adorning the small memorial erected in the grounds. The most prominent feature of the memorial is the official banners with pictures of the martyrs on them. We pray that may God grant peace to their loved ones and bless their souls by honoring them with the highest ranks in heaven. Amen! Who was behind today’s attack on the Sri Lankan team? Teeth Maestro is currently running a poll on his blog regarding people’s opinion on who do they think planned a terrorist activity of this magnitude and significance. Who would you blame for the Lahore Attacks? Posted in Crime, Quiz - Poll, Sports | Comments Off on Who was behind today’s attack on the Sri Lankan team?